Congratulations to Sally and Jade for a super fast reunion compliments DFD Found by Phone consult line. Special thanks to Jill for all her advice on this case. 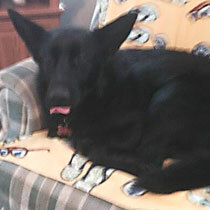 Sally young lost her 20 month old black German Shepherd Jade at about 11 in the morning. She called DFD right away. Part of our action plan was a suggestion to fire up the grill real quick and cook some hotdogs or meat. Well, Sally went barbecuing with some good ‘ole beef hotdogs and Jade came running to the grill in less than 15 minutes!